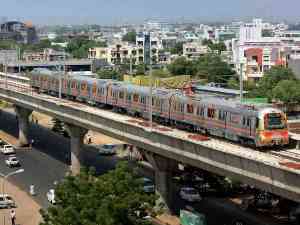 Lucknow: The Lucknow Metro Rail Corporation is planning to include East-West (E-W) corridor in phase I of the project, some more phases of metro rail are likely to come up in the city over the next 15 years. Phase I comprises a 35km metro-track from Amausi Airport to Munshipulia under North-South corridor (about 23 km) and from Vasantkunj (on way to Malihabad) to Charbagh railway station (about 12 km) under E-W line. Metroman E Sreedharan said, considering rapid development and population growth in state capital, it would be imperative to have at least 150km total metro-route in city to fulfill most of the commuting needs in the next 15-20 years. “We believe Lucknow metro would need more link routes in future to cover most localities. Hence, we need to launch more phases of metro over time to cater to maximum people” Sreedharan said. “At least three phases of metro need to be launched in city to cover the population” LMRC Managing Director Kumar Keshav added. Earlier too there were talks about constructing some link routes to the two main corridors. A link route was planned up to Shaheed Path along which many housing projects are mushrooming and the area is considered highly pristine. The same route was to cover localities of Gomtinagar and its extension. Another plan was to run metro from Awadh Hospital Chouraha on Kanpur Road up to Sitapur bypass near IIM, Lucknow.